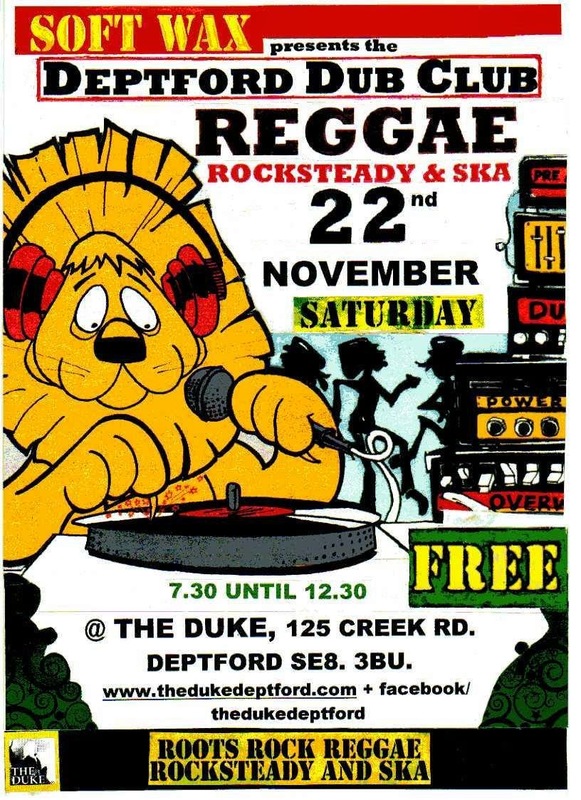 'On Saturday 22nd November we’re re-convening The Deptford Dub Club at the Duke. From 7.30 to 12.30 we’ll be playin’ the best in foundation Jamaican roots music from Ska through to the present. Our special guest selectors for this session are David Katz and Dub Plate Pearl. David is an acclaimed author and broadcaster on all things reggaematic and a wicked selector. Pearl is also an a great selector, well known on the circuit, who’ll be sure to rock the house. Not forgetting yours truly; I probably need no introduction for Soft Wax regulars and will be delving deep into my musical dub basket for this edition of The Deptford Dub Club. Our MC for the evening will be rising star Sun I Tafari. Sun I has already graced the stage at the annual Brockwell Park Reggae Festival. This young lion has released a number of acclaimed records and has a fresh LP due; check him on sunitafari.com. He’ll be joined by Eli Love. Also live on the mic, we’re warmly welcoming back Jaz on Reeds.